Our family is on the move. Just an hour and a half north. Still in the beautiful deep south, although very hot and muggy currently. This is our new view. This view is familiar, yet new all at the same time. I grew up seeing this view about once a month or so. This is the view from the front porch of my grandmother's house. She was one of my most favorite people to walk this earth. A true selfless person who always thought of others first. Thanks to the generosity of my mom, our family has the priveledge of living in this house I love. My grandmother was an inspiration to many and I feel it a great honor to live in the house where she raised her family. I just know that she is smiling down from above as she watches us scurry around to try and fit our large family in a fairly small space. To know the full story and how the puzzle pieces fit together so perfectly reassures us that this is all in God's plan for our family. Mike and I had been feeling the tug about adding another child to our family, but we both knew with the demands of running Hope Hollow full time that it just wasn't the right time. But, now that I will have more time to be a full-time mom again, the thought came up time and time again. 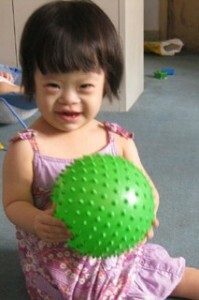 Miss Emma Claire is 2 years old and waiting for us in China. Since we are at the very beginning stages of the adoption process, we still have much time ahead of us before we meet our sweet baby face to face. But, for now, we pray. We pray for her health. We pray for her heart to be softened and to know that she already has a family who loves her very much. Would you join us in praying for our newest little one? There is another way that you can join us in our journey, as well. As most of you know, adoption can be very expensive. So, we are having an ipad giveaway to jumpstart our fundraising efforts. All donations made through Project Hopeful are tax deductible and will be paid directly to our agency for adoption expenses. We thank you for your support and are excited for you to join us in this journey.